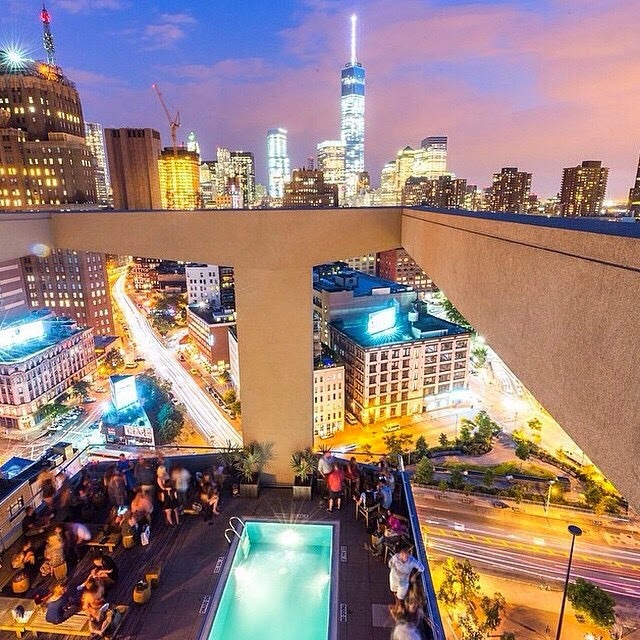 There are two words in the English language that are guaranteed to make any New Yorker's ears perk up: rooftop pool. (These are second only to "rent stabilized.") When you utter those words with the hazy heat of early summer lingering in the air—we'll practically lick your boots if you'll point us in the right direction. As I mentioned in my Williamsburg staycation post, the key to making the most of a home-away-from-home in the city where you live is to just embrace the splurge. Make it special. Make the whole thing special—not just the hotel. Do a little shopping. Have one too many cocktails. Eat an indulgent meal—or three. There are few neighborhoods in New York City that ask you to embrace indulgence more than Soho (and by extension, Nolita). Full of posh shops, delicious restaurants and plenty of cobblestone streets just waiting to be strolled—it's the perfect part of town to get lost in for a (little) while. And, with long weekends and summer Fridays in your future... I don't think I have to finish that sentence. 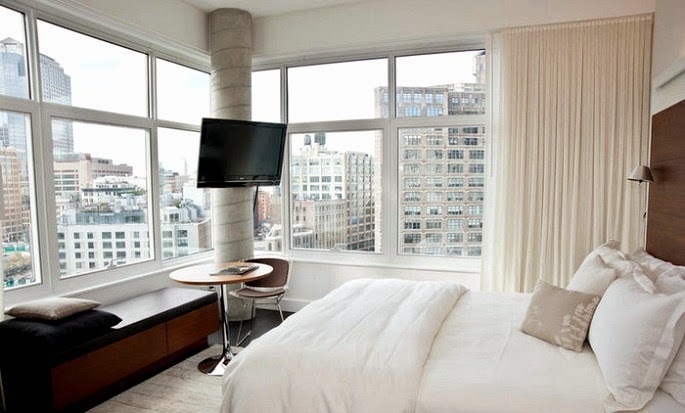 WHERE TO STAY: There are a lot of places to stay in the Soho area, but as far as amenities and in-room views (if you choose to splurge), you can't quite beat The James Hotel. The rooftop pool is exclusive to guests for at least some of the day, every day (starting Memorial Day weekend), they have complimentary Public bikes and a car service available for guest use and check-in/check-out time is a generous 2 p.m. As for the rooms? Go all-in for a corner studio and revel in the flood of natural light, and the city views that envelope you on two sides. Crisp white linens, cozy robes and a sleek, minimalist design make the rooms feel comforting and worlds away from your apartment. WHAT TO PACK: Think of NYC weekend wear in the summer as resort style with just a bit of city-ready polish. Ground a gauzy maxi dress with a denim jacket and stacked-heel mules for warm nights out; have tennis shoes at the ready for a morning coffee run in that same maxi. At The James you'll want to have a sleek swimsuit on hand for a dip in that rooftop pool, and for sleeping, a summer-weight little chemise you can slip into and then slip under the buttery-soft white sheets. Finally, throw it all in a cool carryall that suggests you take summer pretty seriously. JIMMY AT THE JAMES: If you arrive before 5 p.m. on a warm, sunny weekday, by all means head directly to the rooftop pool. Take a dip, have a cocktail and take in the cityscape and peeks of the Hudson River. If the weather isn't cooperating, have a cocktail inside all the same. HOUSE OF SPEAKEASY: Over at City Winery on Varick Street, you'll find one of those "only in New York" kind of events happening every few weeks. Settle into your seat, order up some wine (plus the burrata and steak entree, IMO) and let your mind be expanded by a series of talks by talented writers, poets, philosophers and all manner of deep thinkers. The next night of literary cabaret is June 15, and the theme is "Summertime Blues." 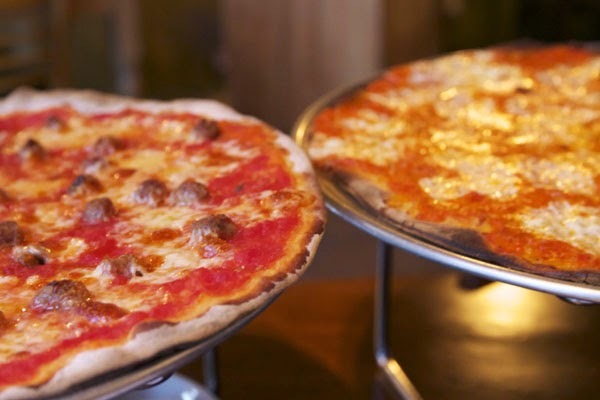 RUBIROSA: If "literary cabaret" isn't your thing (but wine and italian food definitely is), walk or bike your way up and over into the Nolita neighborhood for cozy-cool downtown vibes, delicious pizza, pasta and plenty of that beloved vino. The atmosphere is dark but also incredibly social and lively—perfect for embracing the energy of this small but lovely set of blocks. GROUND SUPPORT: Kick off your day with a coffee or espresso at Ground Support—a light, airy spot that manages to feel like a local secret despite its heavily-trafficked location at Spring and West Broadway. CARSON STREET CLOTHIERS / REFORMATION: Any trip to Soho (whether local or visiting) would be incomplete without a bit of shopping. Unfortunately, though, the bulk of the neighborhood has been dominated by oppressively crowded chain stores and stuffy designer boutiques. Skip both and pop into some top-notch independent retailers like Carson Street Clothiers (a perfectly curated selection of upscale menswear) and Reformation (sustainable and vintage fabrics come together for the best dresses—ever). CAFE HABANA: It's not like you need an excuse to eat at Cafe Habana, but still—a #treatyoself staycation in Soho will do. This place is always crowded on the weekends, so prepare to wait (and people watch!) or stop in on a weekday for grilled corn, plantains and all the delicious brunch things you can imagine—and all for a ridiculously reasonable price. THE NEW MUSEUM / THE NEW WHITNEY: Take a jaunt either east or west of The James and take in one of Manhattan's downtown museums. The New Museum is always interesting and frankly, full of pretty weird installations, but a very cool, cultured way to pass an hour or two. The new location of the Whitney Museum of American Art in the Meatpacking district is hot, hot, hot so buy tickets in advance and expect some crowds. 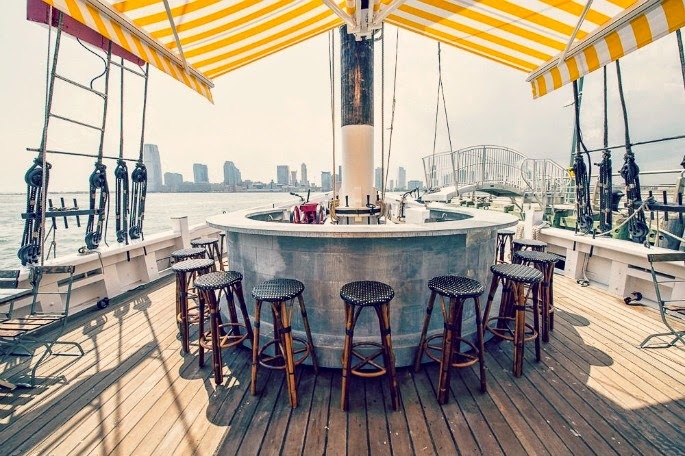 GRAND BANKS: Here's what you need to know: This floating bar/restaurant on a boat sailed back to Pier 25 in TriBeCa mid-May, and when the sun is shining and that city humidity is driving you to crave negronis and lobster rolls on the beach—this is as close as it gets. Post up on a stool, order a bottle of rosé on ice and let the wind get into your hair. You can walk here easily from The James—and you should. EMMETT'S: Chicago-style deep dish pizza, intimate, dimly-lit vibes and all the wine. This little boîte on MacDougal street is a killer spot for anyone who needs comfort food, good tunes and to sit really close to someone on a barstool. * The James Hotel generously provided a night in their Corner King Studio, as well as tickets to House of Speakeasy. Thank you for supporting the stories that keep SUILTSOY running! I'm so excited about this post! I'm headed to NYC in a couple days...used to live there straight out of college & haven't been back since. You totally just got me in the new york minute mood, sooo thanks!!! !